﻿ Top 7 Event Marketing Strategies & Ideas » Red Mango Marketing! Create the ‘Fear Of Missing Out’ among your audience. Use content like video or imagery to show them how they will be at a loss if they don’t attend. Contrary to popular belief, people are more interested in an event when they feel they will lose out on something valuable if they don’t attend. ‘“You don’t want to miss this event. Here’s why ’ is a simple but effective email marketing subject line, social media campaign or blog post to generate curiosity about your event. Use multiple mediums and channels to show people what a great time they’ll have at your event. A promotional video, images, user-generated content, and other details that will immediately spark interest are all great resources to excite your audience. It’s like any movie; when the trailer comes out people start talking about it and can’t wait to go see the full movie. A sneak peek- visual or text- will show them that you have taken all the efforts to make this a memorable, fun and rewarding event for all your attendees- it’s an incentive you offer in exchange of their attendance. 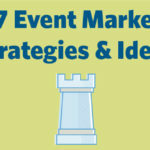 The post Top 7 Event Marketing Strategies & Ideas appeared first on Constant Contact Blogs. This entry was posted on Wednesday, October 3rd, 2018 at 8:35 am	and is filed under Email Marketing, Event Marketing, News & Updates. You can follow any responses to this entry through the RSS 2.0 feed. Both comments and pings are currently closed.